Tri for a Cure marks its tenth anniversary this year. 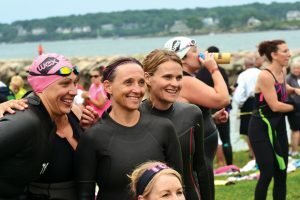 When an anticipated 1,300 women cross the finish line on Sunday, July 23, an elite group of 17 will have completed all 10 years of the annual swim-bike-run fundraising event for the Maine Cancer Foundation. In addition to the blood, sweat and tears each woman puts into her training, participants are also required to raise a minimum of $500—it’s this fundraising goal that will help add up to an expected $1.75 million raised in 2017. Those funds will be added to the nearly $10 million the event has raised since its inception, all going directly to the Maine Cancer Foundation. The women who have fought cancer and won were given the opportunity to meet one another in June. They will come together again the day before the race to enjoy breakfast as survivors. “The shared experience of treatment, surgery and triathlon training creates a strong bond, and we’re so honored to be a part of these women’s lives,” says Bachelder. On the day of the sprint triathlon, participants and spectators will gather near Spring Point Ledge Light, where the swim launches. Following the opening ceremony, the group of survivors is the first to dive into Casco Bay for a 1/3-mile swim. Participants then mount bicycles for a 15-mile route taking them through South Portland and Cape Elizabeth. The final leg is a 3-mile run around Southern Maine Community College, South Portland neighborhoods and Bug Light Park. 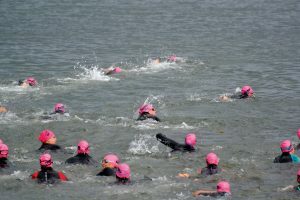 The triathlon quickly became a popular event after its founding in 2007 because it is only open to women. 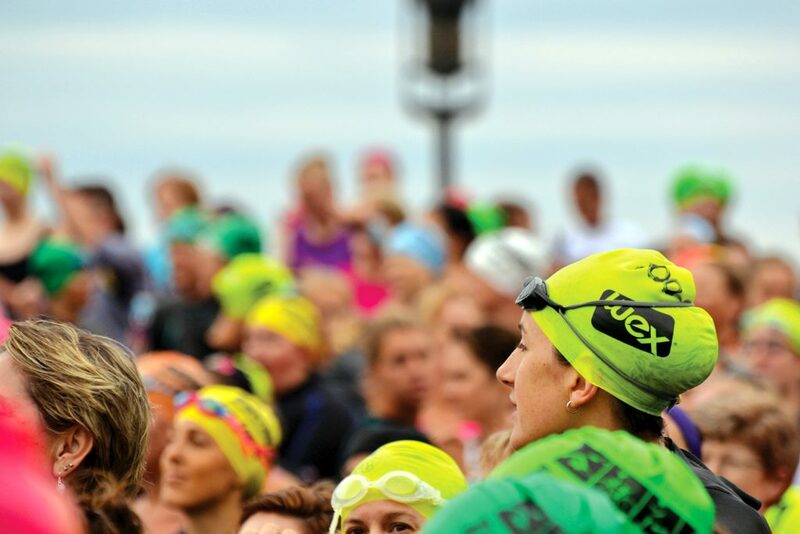 This provides an unintimidating atmosphere for women to challenge themselves to complete their first triathlon. “It is a chance for women to be stars of the show,” says Bachelder. Residents along the race route decorate their homes and come out during the race to cheer along participants. Volunteers along the course provide additional encouragement and assistance. And every year, there are stories of someone going the extra mile for someone else—fellow athletes, volunteers or spectators who step in to offer support to someone they might not even know. Those efforts are vital for the thousands of men and women in Maine who face cancer every year, including the 8,500 and 9,000 new cases expected in 2017. And the Tri for a Cure is a powerful way to support the work of the Maine Cancer Foundation, to further the fight against cancer and to celebrate the battles so many have fought, on and off the Tri course. Emma Bouthillette, a Biddeford native, is the author of “A Brief History of Biddeford.” She loves a good book and walking the beach with her corgi. Because of this support, the Maine Cancer Foundation has awarded 251 grants totaling $10,210,076 since 2008, all toward reducing the impact of cancer on the people of Maine. The 2017 goal is to raise $1.75 million, with more than 1,300 Tri participants. We can’t wait to see all we can do together in the 2nd decade of the Tri for a Cure!